Hand with knife cuts pepper. Pepper on cooking board. Bistro chef preparing lunch. 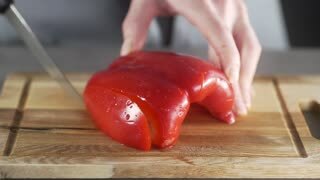 Bell pepper for tasty salad. 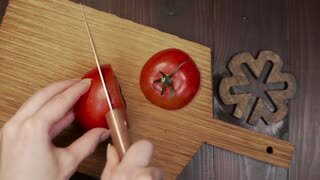 Knife quickly cuts tomatoes. Eggs on cooking board. Fresh cherry tomatoes for salad. Chef peels a cucumber. Hand with knife cuts cucumber. White cooking board with vegetables. Let's cook a salad. Only high quality ingredients. Kitchen knife cuts fish. Raw fish on cooking board. 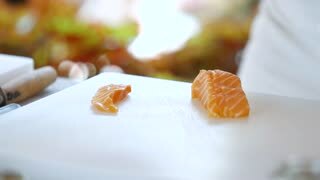 Chef cuts pieces of salmon. Preparing a delicacy. Hands with knife cut tomatoes. Vegetables on cooking board. Bistro chef at work. Cut them in half. 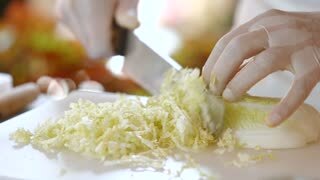 Knife quickly cuts cabbage. Shredded vegetable on cooking board. Chinese cabbage for tasty salad. 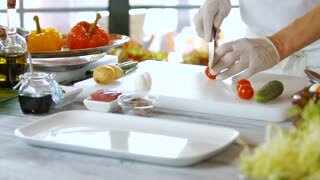 Chef's hand with sharp knife. Kitchen knife cuts pepper. Colorful pieces of bell pepper. Sweet ingredient for organic salad. Juicy vegetable on cooking board. 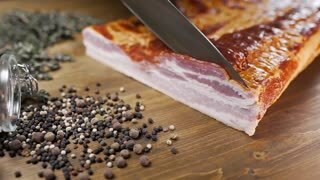 Knife cuts red meat. Raw meat on cooking board. 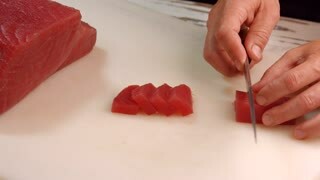 Tuna pieces on chef's table. Cooking is an art.